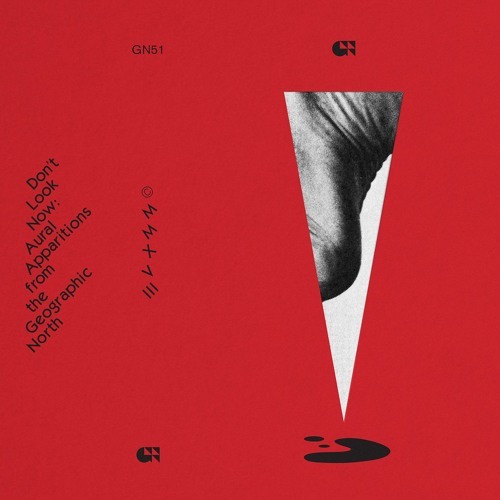 Purchase: geographic-north.com/cassette/dont-look-now/ Catalog #: GN51 Cassette, limited to 300 Geographic North proudly presents 'Don’t Look Now,' our second frightening foray into Halloween-inspired sounds to delight and dismay throughout the season. Featuring 90 minutes of haunted, hellish hysteria composed by some of the most abominable names in ambient music, the compilation nearly splits at the seams with grotesque grace. All proceeds from this morbid mirth go directly toward youthSpark, an Atlanta-based non-profit that works directly with, and protects, at-risk youth from exploitation, abuse and trafficking in the Southeastern United States. http://youth-spark.org/ The compilation opens with “The Visitor,” a peculiar prologue that portends potential peril ahead and one of two bookends concocted by Arp, who serves as the compilation’s crypt-keeper of sorts. As the fog begins to swell, Ka Baird’s “Clearing” brings a trickle of overcast textures and exquisitely disorienting organ tones. Algiers shatter into the scene with brooding vehemence, sounding like a biting mix of John Carpenter and the Pop Group. Perennial witching hour heroes Anjou bring a moonlit mantra of eroding melodies that blossom with decay. “Sada,” composed and performed by Clarice Jensen, steers the action deep into the underworld, projecting an inverted soundscape of smeared beauty. Western six-string virtuoso Danny Paul Grody carries the bizarre bewilderment into an open den of shimmering, pristine melody and resonance. The first main passage is nailed shut by “Cement Dossier,” one of three anonymous and obscene chapter breaks from the Geographic North house band. Next up, Christina Vantzou and John Also Bennett unfurl a hypnotic hymn of rustic kosmische bliss that balances a deathly mix of paranoia and resolution. Eluvium’s “Surrounded by Illusion” is a mini-epic of textural maximalism that only confirms the Pacific NW ambient godhead’s emotional prowess. Jefre Cantu-Ledesma summons the ghost of Hildegard von Bingen for an organ-filled interpretation of “O virtus sapientiae” that’s both life affirming and devastating. Robert Donne (Labradford, Anjou) crafts a pummeling waltz of soot and emaciation with “Rakkauslaulu,” a stinging salute to Mika Vainio. Ilyas Ahmed offers an ice-cold hand to lead you through the ornately crumbling decay of “Local Blues,” blurring itself almost too perfectly into the eerie, almost too comforting calmness of Félicia Atkinson’s “Little Things.” Richard Chartier assumes his Pinkcourtesyphone guise for a purely cinematic lapse into the netherworld. The incognito amusement continues with “Stabbing,” an extended, slow-motion scene that brings some of Suzanne Kraft’s most volatile and vile work to date. “Thunderhead,” a menacingly paced slow burn from Moon Diagrams (Moses Archuleta of Deerhunter), could be the soundtrack to the most alluring haunted house you’ve ever seen, while Roberto Carlos Lange’s “Indian Rope” casts a curiously charming spell of glitter and gloom. Vancouver’s own Secret Pyramid crafts a bewitching bereavement from the North, permeating everything it touches with bedeviled beauty for an unforgettable climax of bleak allure. Arp returns again to bookend 'Don’t Look Now' with “Love Theme,” a fitting epilogue that reflects on the receding haze with hopeful optimism. Although the sun has finally rose, plenty of shadows remain.